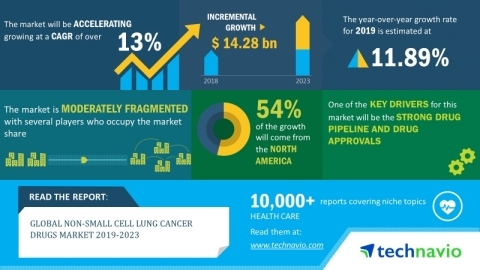 LONDON--(BUSINESS WIRE)--The global non-small cell lung cancer drugs market is expected to post a CAGR of more than 13% during the period 2019-2023, according to the latest market research report by Technavio. “The prevalence of non-small cell lung cancer has increased significantly across the world owing to the rise in risk factors such as cigarette smoking, secondary smoking, air pollution, and occupational exposure. Lung cancer is the leading cause of cancer deaths worldwide. The rapid industrial development and urbanization are also the major factors driving the high prevalence of lung cancer. This will increase the need for new and effective drugs that can treat non-small cell lung cancer,” says a senior research analyst at Technavio.